Chopped, early fall 2016 edition. Thirty minute time limit because I am hungry! I have some frozen haddock. There is a packet of fresh tender okra in my fridge. Yeap, I am in possession of a healthy amount of that crazy southern veggie, okra, which I happen to love. Most times it looks kinda beat up and I pass it by but this day the okra was mighty fine and I selected a packet of it to build my supper around. Also must use ingredients are fresh homegrown tomatoes and a red bell pepper, plus the usual items available in my pantry: onions, garlic, broth. What can I concoct? In about thirty minutes. I was thinking gumbo because of the okra. Yeah, I have heard all the whining about the slimy nature of okra. This cook was determined to not let that travesty occur, so the okra was sliced right before adding to the pan and I didn’t cook it too long. I chopped and sautéed and stirred my pan full of veggies and some haddock. It isn’t quite a traditional gumbo but pretty close and darned delicious considering how quickly it went together. The ripe tomatoes from my garden were the perfect counterpoint to the okra and the flaky fish. I served mine with tiny rice grained gluten free pasta but you could easily use the more traditional cooked white rice to accompany your gumbo. Of course, you could use another protein from the sea like cod, monkfish, shrimp or any firm white fish. Enjoy! Angie’s Haddock Gumbo; Serves two. Chop the veggies. Heat the olive oil in a large sauté pan; add the onion and sauté for three minutes on medium heat. Add the garlic, sauté another minute, stirring. Then dump in the pepper. Cook for a minute before adding the thyme, half the parsley, and the salt. Cook for 3 minutes stirring often. Add the broth and chopped tomatoes, stir and bring to a simmer. Cook for about 15 minutes, stirring frequently. Add the okra and cook for five minutes, add the fish cubes, cook for five more minutes add the rest of the parsley. Don’t overcook it until okra is shapeless and gray; it should be just tender and the tomatoes still holding some of their shape. Taste, add more salt if necessary and up to ¼ tsp. fresh ground black pepper. Serve over the rice or pasta. If you want it spicy, add a dash of Tabasco and a pinch of cayenne when you add the thyme. If you want it soupier; add another ½ to one cup of broth and serve in a bowl. This recipe is from Jane Brody’s “Good Seafood Cookbook” with some modifications. Fresh figs, gotta say I have a bit of an obsession with them. Have had it for most of my life; my dad adored them and we had a fig tree by the house, not that it ever got that many ripe figs on it. Once he took me to meet the old Italian lady who gave him the fig bush, Mrs. Almada. She was ancient but friendly and her fig tree was pretty impressive. I remember buying fresh figs when I was just married in my early 20’s; saw them in the supermarket and had to have a package of six to enjoy, no matter the cost. Dried figs taste okay but fresh figs are amazing. So, many years ago after buying a house and starting to garden…I planted some fig trees. I have 3-4 different varieties. Not sure why they are called trees as they are really more of a bush. Well, here in Pennsylvania that is the case. When I looked at pictures of fig trees from other places they were actually trees! Here they tend to die to the ground or near it so they never get that big or form a true tree shape. Anyway, not that many ripe figs on my trees over the years; a few here and there and most falls a couple nearly ripe ones I eat anyway despite their somewhat poor under ripe flavor. This hot hot summer, my bush branches are mostly full of figs and they are ripening! Wonderful. I picked one or two a couple of weeks ago, then 3 then 5 last weekend and then 7 today. Eating them out of hand is is really tasty but so many figs ripening…needed another way to enjoy them. Simple yet elegant if sticky! Great light appetizer in September. Recipe: This is approximate. Cut each fig across in an x but don’t cut all the way to the bottom. Put a tsp. of goat cheese; I used some with herbs in it…put that cheese in the center of the cut fig. Drizzle a tsp. of honey over 5-6 of them. The recipe said to sprinkle with black pepper or lavender seeds. I skipped that part. Let me know if you try either. I did eat one without the honey; not as good, the goat cheese needs that honey to sweeten it to the tastiest bite. An after note: I tried some floral black pepper from Trader Joe’s on them the other night and it was very good; if you have some of that pepper give it a go; yummers! Recently I found a recipe for a gluten free fig and Greek yogurt cake. Just need a few more ripe figs and you better believe I will be baking one. 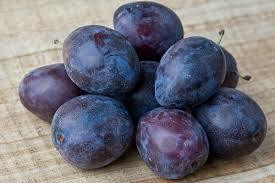 If you don’t have fig bushes, check in the fresh fruit section of your grocery store for fresh figs. Yummy and good for you too. They are full of nutrients and are a great sorce of fiber – important for those of us who are gluten free. Enjoy! 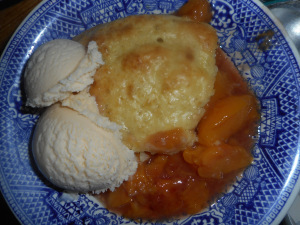 Time for some peach cobbler, originally posted by me last September: 2015. Still the best gf cobbler recipe I have ever made. This recipe is modified from one in Bette Hagman’s book, More from the Gluten-Free Gourmet and is based on a flour mix that will give you 4 cups of the dry ingredients. One cup will make an 8×8 pan of cobbler topping. I bet two cups dry mix will make a big 9×13 cobbler. When I was a kid my mom used to make this jam out of yellow pear tomatoes. Those are small and yellow; about the size of a large grape tomato, and yes, they are shaped like a pear. Just really tiny. They grow in a viney mess of a plant and are definitely old school tomatoes but you can still buy the seeds from superseeds.com. It had a cinnamon flavoring cooked deep into the conserve. It is sweet as any fruit jam generally is, so get that flavor of traditional tomato sauce totally out of your head! Yes, sweet cinnamony tomato jam. It can be done and is amazingly yummy. Mom made this jam for my father every late summer when the yellow pear tomatoes were loaded with ripe fruit. He loved chowing down on it smeared thickly on a big slab of homemade white bread coated with fresh butter. I couldn’t find a recipe anywhere online so I have been experimenting for a couple of years. Finally, I think I have perfected my version replicating Mom’s delicious conserve. I think the secrets are to cook it long and slow until it is truly jammy in texture and the spices are enough but not overwhelming the tomatoes. We will be enjoying it this winter…on gluten free bread, of course! You could also eat it on top of cream cheese spread on a cracker. Or use it in a recipe to add flavor; maybe a broiled fish dish? I am going to experiment a bit with it to find more ways to enjoy my tomato jam. weighing tomatoes; check that fat one on the right! Discard the cinnamon sticks and cloves. They have done their part in flavoring the jam and you sure wouldn’t want to bite down on a clove hiding on your jammed up toast! Sometimes I wash up the cinnamon sticks, let them dry and put them in a small dish as a room potpourri, waste not want not! They still have a lot of cinnamon flavor left in them…. Meanwhile, sterilize five 8-ounce canning jars and lids in boiling water. I think 15 minutes in bubbling water for jars, and 5-6 for lids is fine. Fill the jars with the tomato jam mixture, leaving 1/4 inch headspace, then seal and process ten minutes in a hot water bath. Cool and store in a dry, cool, non sunny location. I always label my jam; sometimes we forget and it is just safer to write a label of what it is and when it was canned so you will know 10 months later just what you have in that jar… Enjoy! Searching for the holy grail of GF cooking: chocolate chip cookies. Bet you thought I was going to say some sort of bread! That’s another post entirely. Anyway, when I went GF 3.5 years ago I made a batch of chocolate chippers that were gf. They were rather sweet and didn’t taste all that great. I keep looking for something that will approximate the real deal I loved all my life. Recipes I came across seemed to require that I buy weird vegetable shortenings or use Crisco. I draw the line at Crisco. Or they used odd flour blends and I feel it’s just not worth it to me to add another flour mixture just for one cookie recipe. So I have not made chippers in 3 years. Missed them….desperately. Store ones I tried were small, hard, drab in flavor and incredibly pricy. Less than a week later I made up a batch; 2/3 with walnuts and 1/3 nut free for my nut hating friends. Froze them all on trays and then into freezer bags except one tray to bake. Made those last Thursday and tested them on my friend Josh who came to supper. Goal scored; perfect brown sugar nutty flavor and texture; not too hard or too soft. I am a happy chocolate chip cookie lover at last! I put some in my cookie jar, closed it tightly and 4 days later those cookies (what remains) are still delicious. That is pretty long for a gluten free baked good. By the fifth afternoon my last cookie in there was getting soft so suggest not holding them for more than 4 days in a jar. I love that they can be frozen ready to bake in like 12 minutes. So, if you are still looking for a great gf chocolate chip cookie look no further: http://www.kingarthurflour.com/recipes/gluten-free-chocolate-chip-cookies-recipe. Enjoy!